Civil War sites are always a great find and even greater when they are free. This Civil War site is specifically for Soldiers from the State of Pennsylvania. The records that are available for research are the extracted format with the original documents not available for viewing. If you would like to research this database, please note that there is a search box at the top of the entry page, but this takes you directly to FootNote.com which is a subscription website. There are several databases which are available for searching using the sites search engine which is located only on the bottom of the Rosters page. This is not the most effective place for the search engine, but it will search the entire site which eliminates browsing which could be very tedious considering the number of records available. 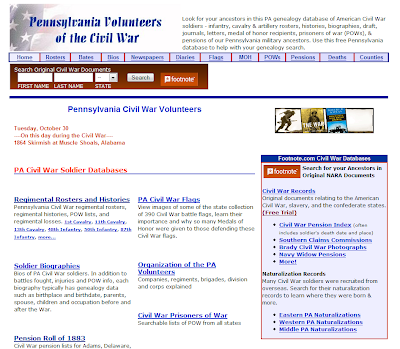 If you would like to browse or research this site, click Pennsylvania Civil War Soldiers. Have Fun!